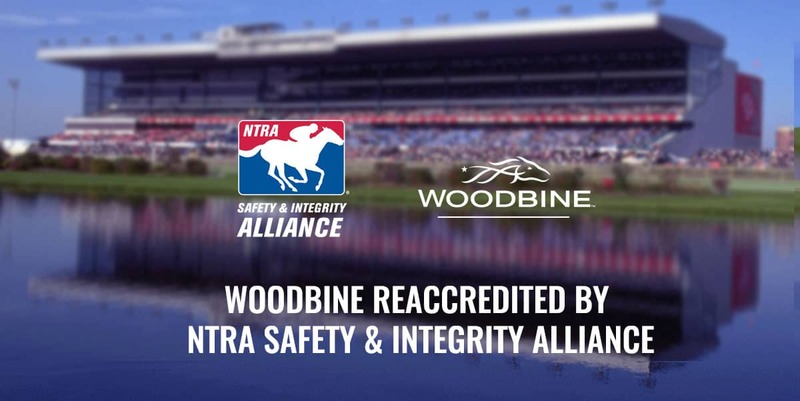 The National Thoroughbred Racing Association (NTRA) announced today that Woodbine Racetrack in Rexdale, Ontario, near Toronto, has earned reaccreditation from the NTRA Safety & Integrity Alliance. Woodbine opened in 1956 bearing a name associated with racing in the area since 1874. The track opens its live Thoroughbred racing season Saturday for a 133-date meet that runs through Dec. 16. Meet highlights include the 159th running of Canada’s most famous horse race, the $1 million Queen’s Plate, on June 30; the $800,000 Ricoh Woodbine Mile on Sept. 15; and the $800,000 Pattison Canadian International (G1) and $500,000 E.P. Taylor Stakes (G1) on Oct. 13. Overall the meet will offer a total of $67.6 million in purses, including $16.6 million for stakes events. The reaccreditation of Woodbine was the culmination of a lengthy process that began with the track’s completion of an extensive written application and continued as the track hosted several meetings with Alliance officials. An on-site review included inspections of all facets of the racing operations. Interviews were conducted with track executives, racetrack personnel, jockeys, owners, trainers, veterinarians, stewards and regulators. The inspection team was comprised of Dr. Dionne Benson (veterinary and regulatory consultant), executive director and Chief Operating Officer at the Racing Medication and Testing Consortium; Mike Kilpack (security and integrity consultant), past chairman of the Organization of Racetrack Investigators; Steve Koch, executive director of the NTRA Safety & Integrity Alliance; and Cathy O’Meara (racing operations consultant), coordinator of the Racing Officials Accreditation Program. Woodbine received its initial accreditation in 2010. All accreditations and reaccreditations carry an effective period of two years. Woodbine is one of 23 racing facilities fully accredited by the Alliance that together host 90 percent of graded stakes and generate 75 percent of North American pari-mutuel handle. The others are Aqueduct Racetrack, Arlington Park, Belmont Park, Canterbury Park, Churchill Downs, Del Mar Thoroughbred Club, Fair Grounds Race Course & Slots, Finger Lakes Gaming & Racetrack, Golden Gate Fields, Gulfstream Park, Indiana Grand, Kentucky Downs, Keeneland, Laurel Park, Los Alamitos Race Course, Monmouth Park, Pimlico Race Course, Santa Anita Park, Saratoga Race Course, Suffolk Downs, Sunland Park, Turfway Park, and Woodbine.